Comments: Born in Austria as Ernestine Rössler, she was a celebrated operatic contralto in both Europe and the United States of which she became a naturalized citizen in 1908. Fred Weatherly provided the words of Danny Boy, but the melody was first published in George Petrie's The Petrie Collection Of The Ancient Music Of Ireland in 1855. The nameless piece bore the annotation that it originated in Londonderry and so became known as The Londonderry Air. Ernestine Schumann-Heink was a German contralto with the New York Metropolitan Opera. 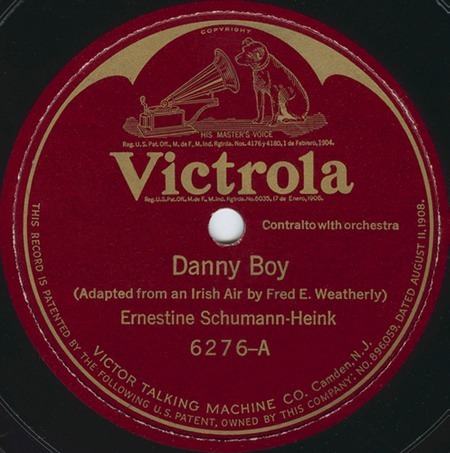 She first attempted to record "Danny Boy" in September 1915 for Victor, but was apparently unsuccessful, as the recording is indicated with the status "Destroy" in Victor's own discography. Two years later, on 26 September 1917, in Camden, New Jersey, Schumann-Henk produced the first master, which was released as a 12" disc on a number of Victor labels.